Strain tofu & put in food processor together with maple syrup, coconut cream, lemon zest, vanilla & lemon extracts & blend until smooth. Put lemon juice & agar powder into a small saucepan on medium heat & stir until agar is dissolved. If lemon juice starts to bubble before agar is dissolved, lower heat & continue to stir. Remove lemon juice from heat & add to lemon curd mixture while food processor is running. Transfer lemon curd to glass bowl or jar & refrigerate for several hours before serving. Open bottom of can, discard clear liquid & scoop out remaining coconut milk solids & whip until thick & fluffy. Add maple syrup & vanilla & whip until combined. Combine half of whipped cream into the curd for a lighter lemon mousse dessert. 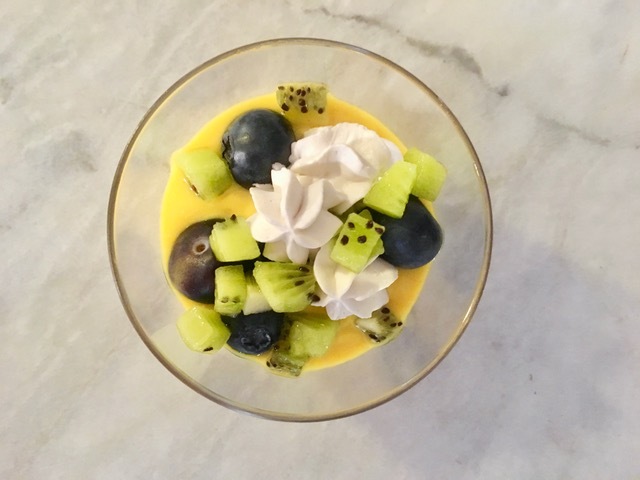 Use the rest to serve as topping and garnish with berries & kiwi.